Do we have FREE TIME or do we have to stay with the group 24/7? Unlike the typical bus tour of Europe, BUZZ’S hotels are located directly in the center of the city, so you have the freedom to come and go as you like. You can stop in for a midday power nap or shower before hitting the nightclubs. There are NO curfews & NO Lockouts! You cannot beat the hotel locations! We understand that each person has a different personality with likes and dislikes, so we run activities and explore each city every day from 8am to midnight, or later, so you can get the most out of your vacation and see what YOU want to see. With BUZZ, you have freedom of choice-- join us on our tours of the city, or take the time on your own to visit your personal “MUST SEE” site or museum. If you're not interested in nightclubs or discos, ask BUZZ, and he will offer many alternatives, and might even take you on a night tour of the city. IF YOU DEPART FROM THE SCHEDULED ITINERARY YOU ARE NO LONGER PART OF BUZZ'S ADVENTURE TOURS. Can I go by myself or do I need a roommate? Join us on your own! Don’t let lazy, flaky or unmotivated friends prevent you from Your Adventure of a Lifetime! Meet new friends from all over the world! On the past 21 summer tours, over 10% of the participants were solo travelers. Get to know everyone on the tour, and have the adventure you've always dreamed of! How many people go on each tour? We run every tour with a minimum of 10 persons, and a maximum of 200 persons,in 3 sub groups of 60+ persons each. How physically active is the tour? All our tours are very active, requiring lots of walking (up to 8 miles some days), climbing several flights of stairs when seeing monuments, being on your feet for hours while seeing museums, and dealing with all types of weather. It's your decision in the "adventure towns" if you would like to go on a more rigorous hike or spend time by the pool! The tours have SOLD-OUT for the past 22 years. Mail your deposit TODAY to guarantee your spot on the tour. Go to Pricing and Registration page for the Tour you want, and follow the simple instructions. Stop by Costco photo department, Fed-EX or your local drugstore and get 3 passport photos. Go to www.state.travel.gov and look for applications, fees and the processing center near you. Do it now, it can take up to six weeks! One of the passport photos must be attached to the BUZZ’S trip application form. Do I need any travel visas? If you are a LEGAL U.S. citizen, you do NOT need any visas for the countries we are going to visit. If you have citizenship from another country or you only have a green card, you must check with your Embassy or Consulate and the U.S. Government. DO IT NOW, It can take several months to process your travel visa. Who is our Tour Guide? David Bussing A.K.A. BUZZ. BUZZ has spent over 46 months in the past 22 years traveling Europe. He has visited over 17 countries and taken over 1,800 train rides throughout Western and Eastern Europe and Great Britain. BUZZ will show you the famous sites, cheap eats, hot spots, and nightclubs, and help you avoid the tourist traps, pick-pockets & con artists. Can we extend our tour and go on our own? YES - Let BUZZ teach you skills needed to travel on your own, then take off and explore the world! Do you have any shorter tours? Yes. You can start and end at any of the cities we visit. Why aren’t all the meals provided and included in the tour price and How much Does food in Europe Cost? 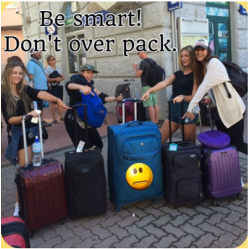 You must be able to carry your own luggage, sometimes up 3 flights of stairs or more, and walk up to 15 minutes from the train station to your hotel with your Rolling Suitcase. Be able to board subways and trains and have the ability to lift your luggage into the overhead racks. Yet another reason to pack light. What type of luggage do we need? Small suitcases with wheels are now very popular, and most of you already have one at home. You must be able to carry them up many stairs. 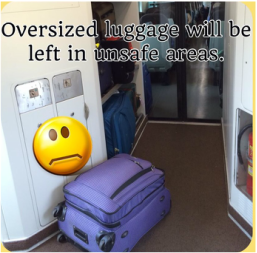 Don’t worry-- you only carry your luggage when transferring to and from the train station and your lodging. A backpack or messenger bag, just like what you use at school, is perfect when you are exploring the sites of the city. Load it up with your water bottle, camera, and snacks, and go see the world. Maximum luggage size is 24” tall x 18” wide and 10” deep. NO Exceptions! "The Lighter you pack, the happier you will be"
Yes! Pack clothing for 10 days and you will only have to do laundry once or twice in Europe. Laundromats are located near our hotels in Paris, Florence, Interlaken and Amsterdam.